traditional IT workloads. Low capacity drives also help address architecture limitations. performance and lower acquisition cost to help ease budget constraints. conventional magnetic recording (CMR) technology in a 3.5-inch large form factor. cache (NVC) on both SATA and SAS models helps improve write performance. reduce RAID rebuild times and maintain system performance during the rebuild process. Compliance and privacy requirements drive the need for increased data security. encryption options. 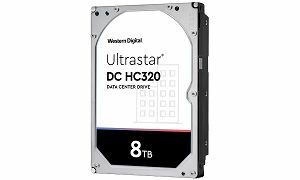 The Ultrastar DC HC320 extends Western Digital’s long-standing tradition of reliability leadership with a 2M-hour MTBF2 rating and a 5-year limited warranty.